It was one of the hottest days of our 2018 summer when we headed for the Cotswolds, just north of Oxford, to have lunch at The Churchill Arms. At first we thought we had reached the Hovis village where the iconic TV advert was filmed (but that’s miles away in Dorset) as Paxton is picture postcard perfect and there were those large green Hovis signs on a shop. 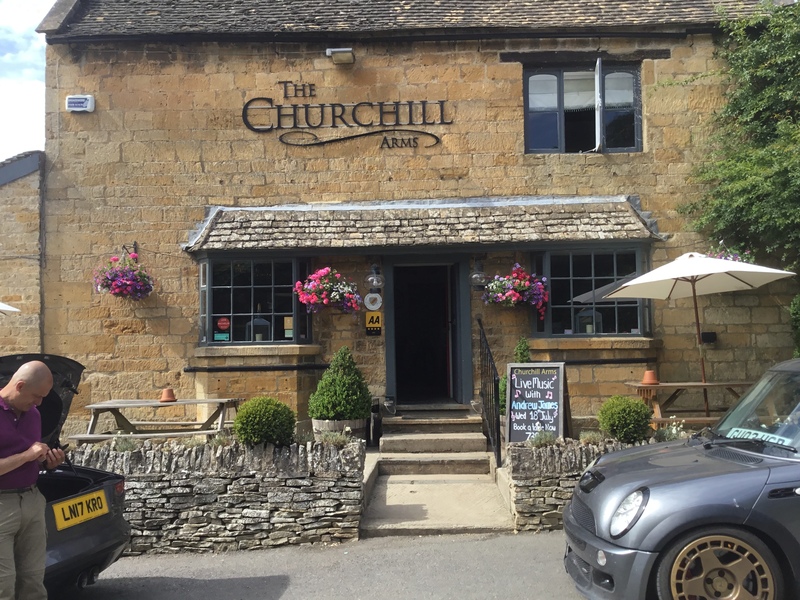 The Churchill Arms was easy to find – its made of lovely mellow Cotswold stone and set on a corner. It’s a fair way from Blenheim Palace so when we asked about the Churchill connection we were told that the pub was once part of the Blenheim estate? Although it was midweek there were plenty of people sitting in the garden which is a good sign. Given the lovely weather we decided to eat al fresco but walking through the bar – where there is a wood burning stove – you could see it would be a very cosy place in winter. Given that neither of us had had breakfast we could not wait to get our hands on the menu and order some food. The menu arrived along with some very welcome chilled sparking water. There were so many delicious choices, the majority with local sourced produce, coupled with the fact that it was so hot and we wanted to eat relatively light that we spent about 20 minutes trying to decide what to have. So we got our priorities right and ordered the wine first! We went for the house wine, a Petit Paul 2016 Domaine Robert Vic, from Southern France, which turned out to be a spot-on choice as it was light and fruity – perfect for a hot day and only £19.50 a bottle. 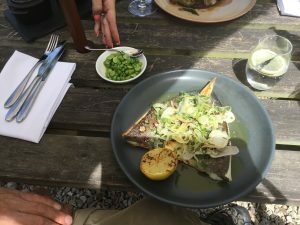 My guest decided on the Pea & Mint soup with homemade bread (£6.50) followed by a whole Cornish Sea Bass, shaved fennel, local radish & new potatoes (£18.50), while I chose the Cornish Scallop, confit bacon, creamed sweetcorn, popcorn (12.00) followed by one of the pub’s ‘classic’ dishes, Pork T-bone, caramelised apple, sage, cracking, mash (£17.95). It was a closely-run choice with the Roast Burford Chicken, oyster mushroom, local spring onion, and broad beans (£17.50). The two young people who were front of house, barman and waitress, were delightful. 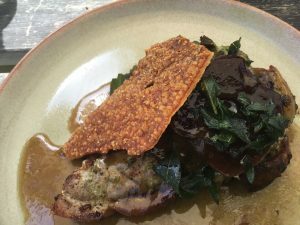 Their service and attention to detail was 100% – and despite a huge local crowd arriving, they had time to tell us about the food and where is was sourced (locally) and share a joke or two. They didn’t blink an eye when my guest Alan who was suffering from jet-lag after flying in from Portland, Oregon, ordered a coffee to wake himself up before eating lunch! 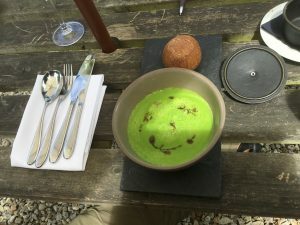 When the food arrived it was so beautifully presented and a feast for the eyes – and so it continued – savouring it was like ‘heaven on earth’ – in combination with the beautiful village setting in our incredible English countryside. 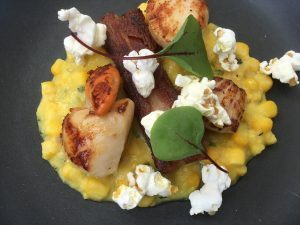 My scallop starter(pictured above) was perfect – with just a hint of anise which goes so well with seafood. 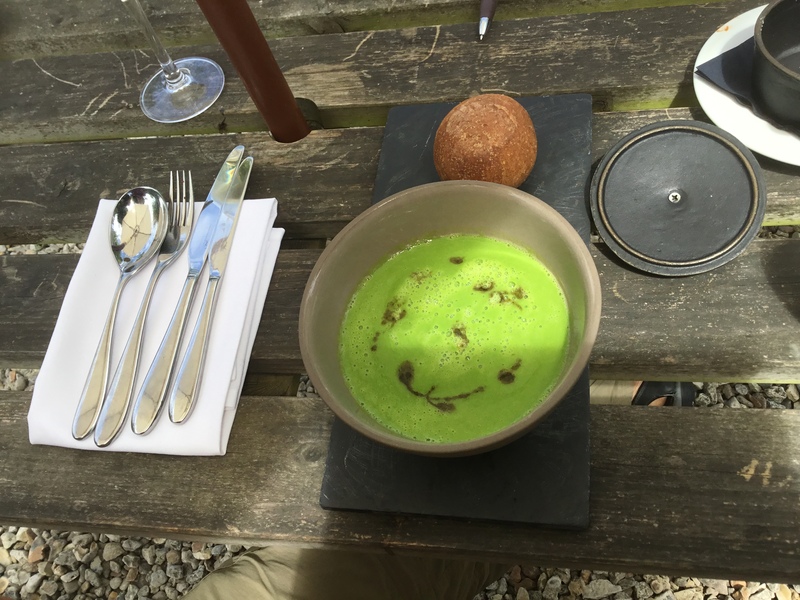 My guest said he had never tasted such a marvellous soup as he wiped his plate clean with the bread. Now the deserts…..the perfect Tart Tatin with vanilla ice-cream and a Rhurburb & Ginger Crumble and custard (both £7.) – absolutely fabulous! At the helm of this glorious bolt-hole is Nick Deverell-Smith, who is both chef and owner. During our visit he took time from his busy and hot kitchen to come and say ‘hello’ – that really impressed us. 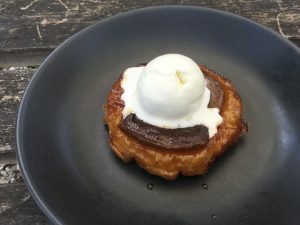 He told us about his passion for sourcing the best local produce – and it does show in the quality focussed menu which is designed to give a new twist on British classics. Nick trained under some of the best chefs in the industry, including Marco Pierre White and Gordon Ramsay – learning the best of their culinary expertise but taking none of their bad manners! And despite TV exposure on the Great British Menu and BBC’s Saturday Kitchen, he is a down to earth chap, working in partnership with his employees. At the end of the lunch service we saw him take his shopping bags and go off to source more fresh delights for dinner that evening. The pub is also a place for locals with curry & cocktail evenings and the like so they are not being squeezed out by a posh gastro pub that is catering for tourists. That is a good thing. I for one cannot wait to go back to try the Lobster Macaroni Cheese, the Calves Liver with Confit Bacon & Cider Onions, or Nick’s signature Smoked Haddock Soufflé. 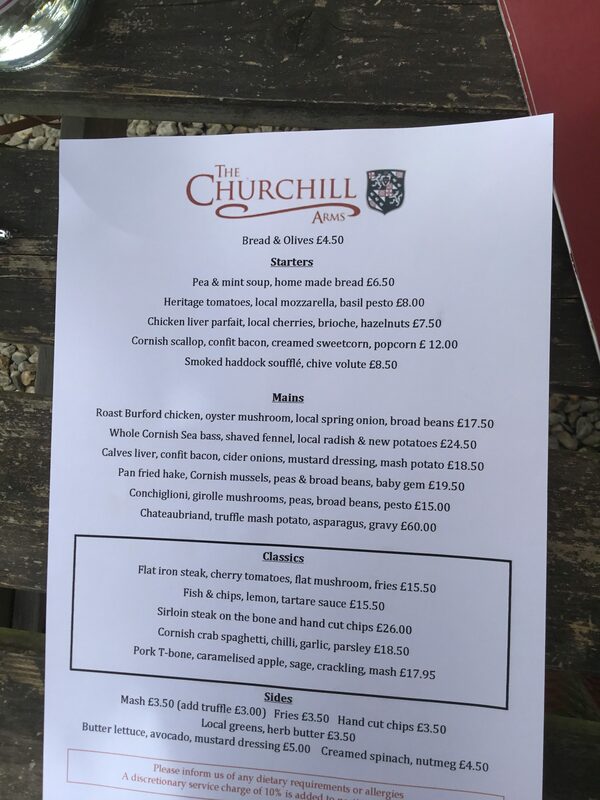 The Churchill Arms is open 7 days a week and also has 3 charming rooms at £120 per night. The Churchill Arms has three bedrooms – beautifully decorated – sink beneath the Egyptian cotton sheets! Tagged Burford, Churchill Arms, gastro pub, Oxford, Paxton.